Whether you’re a first, second or multiple time parent, you always want your child to have the best of everything. Literally, from the minute I found out I was pregnant, I put pen to paper as I flicked through countless baby brochures and websites, listing as I went. I’ve since learnt that not everything is an essential buy! To provide you with some guidance, here’s a list of my 5 essential buys for new parents. Of course, every baby is different so these may not work for you, but they might give you a little inspiration! When you leave hospital, you must have a car seat to be able to take your baby home. It’s therefore always best to have an infant carrier on hand for that first car journey home. I always wanted a 360° car seat that’s suitable until they’re 4 years old. 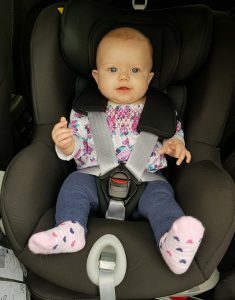 There are so many brands on the market such as Nuna and Joie but when we saw the Britax Romer Dualfix Group 0+/1 ISOFIX car seat and sat our baby in it, she took an instant like to it. There’s also plenty of padding, plus it’s suitable from birth – perfect! For me, the best thing about the car seat is that it turns 360° degrees, so putting your baby in the car can be done with ease. Simply turn the seat to face the door, pop baby in and turn back to face the rear of the car. These car seats vary in price from £250 – £450, so it’s quite an expensive purchase. However, it’s important to remember that they’re long lasting, so you won’t find yourself replacing it until they’re around 4 years old. It’s also forward facing from 9kg to 18kg. Plus, it has many layers of removable padding, so you can adapt the seat as your tot grows. Our baby loves it! There’s a lot of speculation about these machines and if you talk to a midwife many would recommend that you don’t use one. But, the choice is yours and I find it incredible. For speed and convenience, the Tommee Tippee Closer to Nature Perfect Prep Machine really is the best buy! It makes the bottle to the exact temperature that you need. So, it’s perfect for making quick bottles during the night. Plus, Tommee Tippee have now started to do these in various colours, rather than the standard white. I have a red theme in my kitchen and luckily, we were able to get one to match. Match that with the Tommee Tippee sterilizing machine and your kitchen side looks the bomb! I think play mats are an incredible invention and for me, they’re 100% an essential buy. My little one absolutely loves hers! 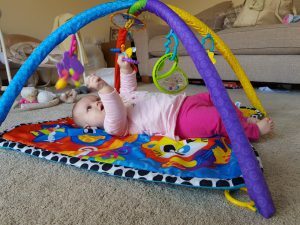 Play mats are great for your baby’s development. 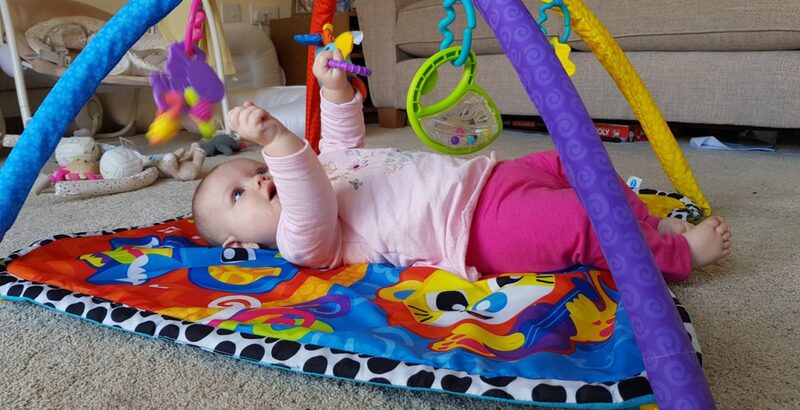 Whether it’s encouraging them to start reaching for the hanging toys, or to roll over and move around the floor reaching for different toys as they turn, play mats are just the thing. There are many play mats available so, there’s something to suit everyone’s budget. I’m sure your little one will live theirs as much as my little girl. Isn’t it odd that you try to create and imitate the surroundings of the womb to help your baby to sleep at night? However, some babies do prefer a little light. If this is the case, then I’d recommend a night light. I was given a night light for my daughter. It plays soft music and natural sounds for some extra peace. There are some night lights that project onto the ceiling to create a tranquil environment for your little one, whereas others make soothing womb or heartbeat sounds. I also think a night light is essential from a parent’s point of view. In the early days of moving your baby into their own room, a night light can offer some reassurance when you pop your head round the door. Seeing your baby’s face lit up by the night light is great for giving you a little peace of mind. I’ve saved the best till last, the Sleepyhead Deluxe. It’s amazing! A baby is so used to being wrapped up all snug and cosy when they sleep to make them feel safe and that can be difficult to do when they are moved into a cot. The Sleepy Head Deluxe helps with this transition. It’s basically a giant cushion that surrounds the baby from head to toe, making them feel surrounded and safe. They’re available in two stages: 0 – 8 months and 9 – 36 months. There’s a variety of patterned covers for them and they can also come with a detachable mobile. However, with such an amazing product comes a hefty price tag, the 0 – 8 month comes in from £120 and the 9 – 36 months, from £180. My husband wasn’t too keen on spending that much on what he saw as simply a giant cushion for a baby! But, ask him now and he’s so glad he did. You don’t have to buy the older stage straight away, as your baby might have already transitioned to sleeping in their cot by that time. My baby is 5 months old and she loves hers. The Sleepy Head is comfortable, and portable, so you can lay your baby down to sleep in it wherever you like. Say hello to a full night’s sleep! And there you have it, my top 5 essential buys for new parents. Remember that things don’t always have to be expensive and always shop around to find what you think will suit your baby best.